For decades, food security was viewed exclusively through the lens of shortages. In the 1960s, when daily food availability in emerging countries was just 1,850 kcal per person as many as half of the world’s population was malnourished. It’s easy to understand our narrow focus on increasing food production. The challenges we face have shifted. The development and distribution of high-yielding grains, pesticides, and herbicides, as well as innovations around crop management, have been just a few of the transformational changes that are credited with saving millions of people from starvation. By 2008, the daily food availability in emerging nations grew to 2,640 kcal per person. Food production has increased an estimated 300% in the last half century as a result of new technologies that enable farmers to be more productive with their land. The rapid growth in food production continues to outpace the spread of agricultural practices and safety processes that protect the integrity of crops and livestock. 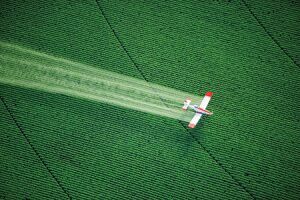 For instance, a number of the pesticides and herbicides that are now ubiquitous have environmental and health consequences we need to examine, and the explosion of crop production in developing nations has made safety regulations more difficult to set and enforce. How do we address all these growing challenges, while still safeguarding our environment and ensuring the food we eat is safe? Having the most effective quantitative analytical solutions that offer inherent selectivity is more important than ever, particularly with complex food and environmental matrices. Today, scientists performing quantitative studies must rely on precise and dependable results to accurately quantify analytes of interest. That means having the ability to detect as many ions as possible while also running thousands of samples without an appreciable loss in performance. This is imperative for laboratories to not only meet tighter regulations around allowable pesticide residues, but to also be able to quantify banned and restricted analytes, even when they are only present at trace-level concentrations. Take for example, dioxins. Dioxins are a group of chemically related compounds, known to be toxic and persistent as ubiquitous pollutants. Therefore, dioxins are restricted internationally under the Stockholm Convention along with other nationally enforced regulations. Last week, Waters introduced the most sensitive tandem quadrupole mass spectrometer on the market for mass spectral analysis. The Xevo TQ-XS combines vital sensitivity and flexibility for food and environmental quantitative and confirmatory analyses. Below you’ll see that the Xevo TQ-XS offers unparalleled results. 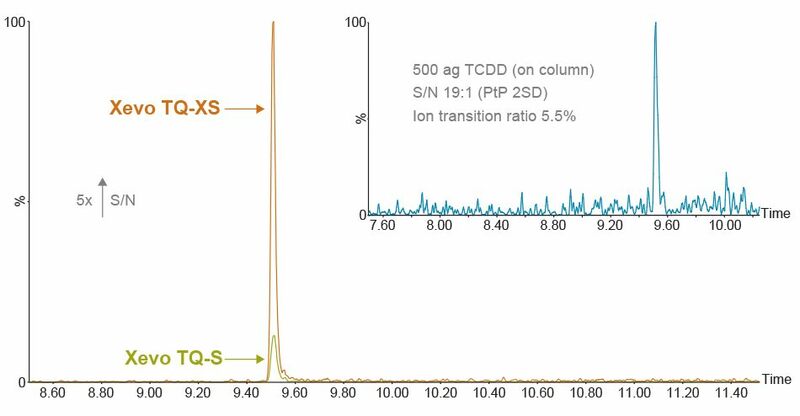 Coupled with APGC, it offers a 5x increase in sensitivity for dioxin analysis. 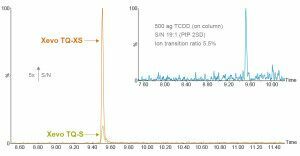 APGC coupled with Xevo TQ-XS offers a 5x increase in sensitivity for 10 fg 2,3,7,8-tetrachlorodibenzo-p-dioxin on column. Inset shows unparalleled sensitivity for 500 attograms of TCDD. With the Xevo-TQ-XS, laboratories can be confident in their results and the knowledge that they are doing everything they can to ensure the safety of the global food supply and environment.